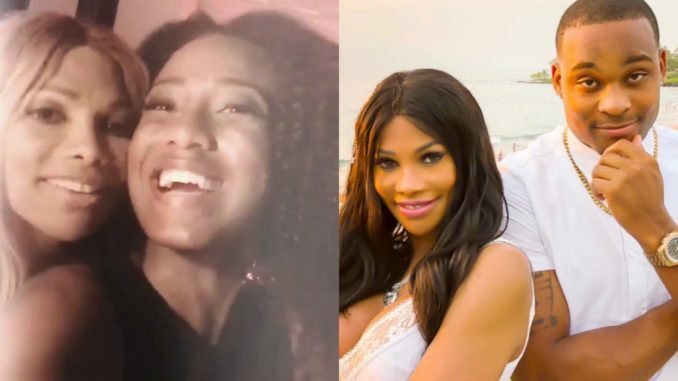 A TV Reporter by the name of Jordyn Taylor took to her Instagram page to blast Salt-N-Pepa’s Sandra “Pepa” Denton for stealing her man, aspiring actor Aundre Dean. According to Jordyn, Aundre introduced Pepa as his “boss”. Jordyn and Pepa got so close, she referred to Pep as “Auntie Sandra”, and Aundre even suggested making Pepa the godmother to their child. As recent as December 2017, Jordyn has pictures of her and Aundre, who she says has since missed visitations with their son as he’s busy taking trips across the country with Pepa. Pepa has since deleted the picture of her and Aundre on Instagram. He’s also posted pictures on set with singer Miguel’s fiancé and The Platinum Life star Nazanin Mandi. Jordyn has a few pics with celebs as well, as part of her job as a reporter. He’s since turned the comments off on his recent Instagram posts as well.